The meshes define the shape of the model. A model can have several meshes. Each mesh is made of triangles, whose vertices are composed of one or more weights, that in turn are attached to the Skeleton of the model. Despite its name, it's not the purpose of the Model Editor to modify the positions of weights and vertices, or to provide means to generally shape the meshes. Please see the The Model Editor: Introduction for more details. Instead, the Model Editor focuses on setting details that are specific to the Cafu Engine. 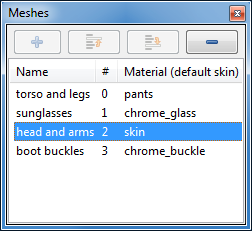 The Meshes pane lists all meshes in the model. A single click on a mesh selects it, a double click opens the Mesh Inspector pane as well. Pressing the F2 key or a single-click on an already selected mesh allows you to rename the mesh in place. The “-” button at the top of the list deletes the currently selected meshes. 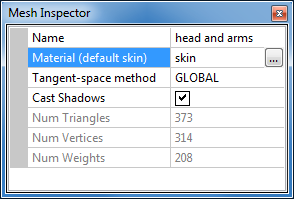 Inspect/Edit opens the Mesh Inspector pane. Rename allows to rename the mesh. The Mesh Inspector pane shows the details of the currently selected mesh. Shows the name of the currently selected mesh. The name can be edited in order to rename the mesh. The material that is used for rendering the mesh is set here: Press the “…” button in order to open the Material Browser. The Material Browser is the same as the one used in the Map Editor, but it only shows the materials that are specific to the currently loaded model. It also has some basic capabilities to edit materials and to set their properties, but is currently not very advanced. At this time, we recommend that you use the Material Browser for assigning materials to meshes, but in order to create and edit material definitions, best use a programmers editor for editing the related cmat material files directly: Material scripting is documented in chapter The Cafu Material System. The tangent-space method determines the algorithm that is used for computing the normal, tangent and bi-tangent vectors at the vertices of the meshes. Ideally, the algorithm that is set here should match the algorithm that was used by the external program that was used for creating the normal map for this mesh. This is important so that the Cafu model code can accurately reproduce the subtle details involved in generating the axes of tangent-space, as only then the lighting results will exactly match those in the original program. Unfortunately, the involved algorithms are not standardized at this time (and often not even documented! ), so that we can only try a best guess. Refer to CafuModelT::MeshT::TangentSpaceMethodT for the currently available tangent-space methods. More tangent-space methods will be added in the future. If in doubt, there is a very simple receipt for choosing the right method: simply pick the one that looks best. This setting determines whether the mesh casts shadows when lit by a dynamic light source. This can be useful for performance tuning, e.g. in order to not have shadows casts for very small meshes that implement model details, or generally for models that are very far away, or never seen in a context where shadows play a role. The last three numbers show the number of triangles, vertices and weights in the mesh. They cannot be changed.